Posted by ronannarbor in Ann Arbor, Broadway Musicals, Entertainment, musical theater, Musicals, Theatre. 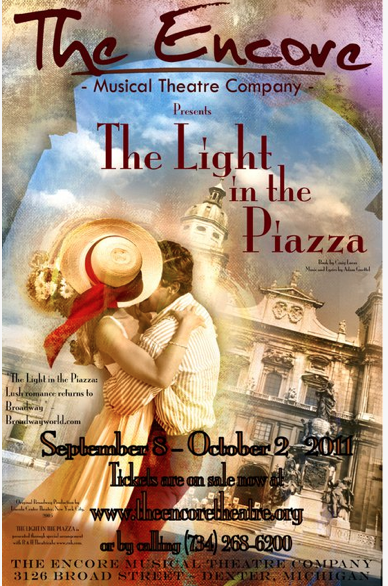 Take a superior score and script; add Encore’s strongest singing cast ever; stir in a new sound system and some terrific direction, and you have, quite simply, Encore Musical Theatre Company’s best production to date with “The Light in the Piazza”. I have to disclose that I am partial to this show to begin with: many friends worked on the Broadway production both on the creative team and on stage. I saw it at the Vivian Beaumont a half a dozen times during it’s run. That being said, this cast is as strong as any I have seen in the show. The production is Directed by Steve DeBruyne, Music Directed by Brian E. Buckner, Costumes are designed by Sharon Larkey Urick, Sets by Toni Auletti and Lighting by Matthew Tomich. I mention their names up front because it is their work that frames this sparkling production. The action, played out on a sparse but lovely set, allows the actors to truly shine. And you have never heard a cast like this on the Encore stage. The very difficult score leans heavily toward legit voices (you know, opera voices for those of you not in the biz), and they sound fantastic on the new sound system that mixes the orchestra with the vocals. I don’t want to give away too much of the storyline for those who don’t know. Suffice it to say it involves a mother (Barbara Scanlon) and her daughter (Stephanie Souza) who travel to Florence in 1953 and where the daughter finds love with a young Italian man (Brian L. Giebler). The will-they-or-wont-they romance plays out in a storyline that heaps levels of surprise and emotion in a deeply layered script that unfolds slowly over the course of the musical and leaves the audience as breathless as the cast by the end of the show. Barbara Scanlon turns in a mesmerizing performance as Margaret Johnson, and Stephanie Souza plays her daughter Clara with aplomb. Brian Giebler as Fabrizio has a wonderful voice and stage presence to hold his own in a cast in which one cast member delightfully outshines the other throughout the evening. Scott Crownover plays a commanding Signor Naccarelli with Marlene Inman-Reilly turning on the vocal dazzlement as his wife. Sebastian Gerstner and Angela Kay Miller humorously play off of each other as the elder son and his wife. All smaller parts are played by an ensemble that includes Curt Waugh, Gil Bazil, Anne Bauman, Natalie Burdick, Lauren Conley, and Elliott Styles. The vocal work here is dazzling — notes are hit and resound in the theater space which is superb for this type of show. The tone is exquisite — nothing is sharp, nothing is undertone…everything is right where it needs to be. The very difficult score includes large portions sung in Italian, often in counterpoint to English, and at times instantly alternating between the two. Adam Guettel’s lush score mixes contemporary romantic melodies with more adventuresome musical styles. This is a very difficult score and it is handled here expertly. The requisite tears come — are they tears of sorrow? Or joy? Do you cry at a wedding? Or does something occur to throw it all out of balance. You’ll have to go see it for yourself, because it all plays out as well as any suspense story you’ve seen. From the romance of a hat blown through the air across a piazza, to the touching moments of a mother learning to come to terms with her own grief — it’s all there. By all means see this. It is the best production Encore has done to date, and you will kick yourself if you don’t get a chance to experience it. Buy tickets for your parents. Send a pair to your grandparents. Take your husband/wife/girlfriend/boyfriend/best friend. Go see it. I am personally getting tickets to see it again. I loved this production.